A 2011 Wind Technologies Report released by the U.S. Department of Energy in August highlights how dependent wind energy is upon government subsidies. The report cites government aid as two of the three key factors that contributed to growth in the market in 2011. 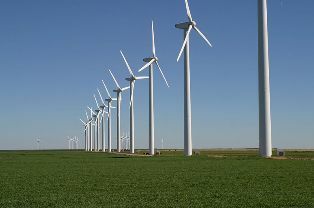 The continuation of state and federal incentives for wind energy and the ability to meet construction deadlines to qualify for a federal grant program were two of the factors. The report states that forecasts for 2013 and beyond span a wide range "depending in large measure on assumptions about the possible extension of federal incentives." The 2010 wind report by the DOE also recognized the importance of federal subsidies to its growth. "On the other hand, with the window of eligibility for the Treasury Grant program scheduled to close at the end of 2011 (though most projects built in 2012 are also likely to qualify) and with federal tax credits slated to expire at the end of 2012, growth beyond 2012 is highly uncertain," the report said. The reason for that is obvious, said Paul Chesser, associate fellow of the National Legal and Policy Center.